Davor Borno started his musical career in 1990, on the last album of Croatian pop-rock band “ITD Band” and became known in the former state Yugoslavia, as a talented new musician and singer. Before that, in 1988, he was the vocalist in Boris Novkovic’s band "Nocna Straža". 1992 to 2012 he successfully participated at the 14 music festivals in Croatia and Slovenia and won many awards at several festivals. In 1993 Borno won the prize for The Best Young Musician at traditional Split Festival. In 1993 Borno participated in the national preselection Dora 93 for Eurosong and missed out on the chance to represent independent Croatia at the Eurovision Song Contest 1993 with the song "Ispod zvjezdica". His second album was “Ljubav ili grijeh”, published in 1996 for Croatia Records music company. Throughout the years of his career, Borno had a lot of concerts in the clubs of Croatian emigrants in Europe and several Yugoslav tours. He also had a big tour with 60 concerts in Ukraine in 1990. Since 2000 Borno is building an extremely successful career in Slovenian music market, where in the last 12 years become one of the most popular Croatian musician whose albums are diamond and platinum. Creating pop music in the native Croatian language with Mediterranean style, he is appreciated abroad as well as promoter of Croatian - Mediterranean music expression, and his concerts are widely visited by devotees of popular Croatian music, regardless of their origin. Since 2000 to 2005 he published 4 albums: 'Što imam od života', 'Tko sam ja', 'Vagabundov sin', and ‘Pozdrav iz Dalmacije - 'The best of Borno 2000-2005', with 17 major hits and four videos, like a crown of musical success in international markets. 2008 in the Croatian market and abroad, Borno released his seventh album 'Mediterraneo', colored with Dalmatian, Italian and Greek sound, melodies and rhythms, which are grown in music tradition in region of the all former Yugoslav republics. Album 'Mediterraneo' is the result of a successful international musical collaboration, guided by the idea of creating a Mediterranean music on the grounds of tradition with modern arrangements and production. Croatian promotion of the album 'Mediterraneo', started with participation at popular Croatian Radio Festival 2008 with the song 'Ljudi'. In Slovenian market, ‘Mediterraneo’ was at the very top of the charts, and according to official data from the national 'RTV Slovenia', it was the best selling Croatian album in Slovenian worldwide chart of the best-selling albums 'Top 30 Slo'. 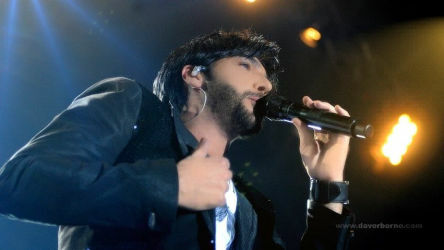 2009 Borno won the audience award of Slovenian Radio and Television " NET TV", for the best performer in 2008. It was absolute victory in all three award categories. In late 2009 he won Audience & Radio Award in the international Festival "MEF 2009." for his original song "Moj je život samo bol”. 2010 released a double album “The Diamond Collection 1990-2010” with 40 most successful songs in his 20 years long career. Some of songs he perform in duets with Slovenian stars. 2010 Borno also released live concert DVD "Greetings from Dalmatia" with 28 songs and Slovenian special guest star Helena Blagne. Borno occasionally composes for other artists. The most interesting is a collaboration with the Slovenian entertainment icon Helena Blagne, with whom recorded a duet in the Slovenian language in 2001. He wrote the song for Helena ‘Ti nisi vreden mojih solz' in 2003, and he was a special guest on her five tours in Slovenia. 2018 - Borno released new single "Dukati" like author & performer. He signed an exclusive multi-year contract with an eminent and biggest Croatian record label "Croatia Records" for newcoming albums.